American painter, one of the leading representatives of action painting, born on January 28, 1912 in Cody (Wyoming) in a family of Irish-esocesa and died on August 11, 1956, victim of a car accident in Southampton, near New York City. The youngest of five brothers, during his childhood and early youth living in a rural environment in different States (Wyoming, Arizona and California). The father abandoned the family in 1920; from that moment Pollock begins to feel strongly attached to his mother. In 1927 he/she entered Riverside High School, ninety miles to the West of Los Angeles, and he/she was expelled in March; then enter at the Manual Arts High School, and after a new expulsion, moves to New York, in 1930, where he/she began to study at the Art Students League with the regionalist painter Thomas Hart Benton. During the 1930s it makes various works and benefits from federal subsidies for artists. They are the times of the great depression and it is almost impossible for artists to live from their work. His first paintings date back to the time in which studied with Benton. "From the beginning, show four features which will be constant throughout his work: global design, dynamic rhythm, articulated and accurate touches and emphatic contrasts of light and shadow..." It is not true that your drawings are awkward, what happens is that what interests you is the global atmosphere of the piece and the interdependent representation, rather than an objective description"(Elizabeth Frank). In those years he/she worked as Assistant to the Mexican muralist David Alfaro Siqueiros, whose work will exert a powerful influence on the Pollock; in 1936 he/she entered in the experimental workshop that Siqueiros had opened in Union Square, where encouraged to experiment with new materials, in an atmosphere of freedom that no doubt encouraged Pollock to develop their own inventiveness. Another major influence received in these years is the Cubism and Surrealism, through two major exhibitions at the Museum of modern art: Cubism and abstract art and fantastic, given art and Surrealism, both in 1936. In 1936 he/she meets Lee Krasner, painter and then student at the school of Hans Hoffman, with whom he/she married in 1945. In 1939, after several nervous breakdowns and problems of alcoholism, he/she started psychiatric treatment. These problems of emotional instability animists him during their lifetime and are those who have fed the myth of the artist; on the other hand, their knowledge of the theories of psychoanalysis of Freud and Jung will convince you that the unconscious is a large pool of images for the artist. During the months of therapy done drawings showing to his psychiatrist, Dr. Henderson, Jung school; These drawings are known as psychoanalytic drawings and show the evolution of Pollock into an own formal and iconographic lexicon, which has been interpreted from techniques of interpretation jungianas. In some of them already you can see a proto-all over and the influences of primitive painting and Picasso, especially of Guernica. At the beginning of the forties increases the scale of pictures; in the female Moon (1942) and masculine and feminine (1942) enter poetic figures of great dimensions in an ambiguous space increasingly more abstract; Male and female is one of his early masterpieces, in which surrealism and Cubism are mixed, while the two totemic figures at the same time function as images and vertical planes. In 1943 he/she met the collector Peggy Guggenheim, who had returned to America to escape the war in Europe and had opened the art of this century Gallery; It gives you that same year a contract to Pollock for a year and his first individual exhibition; the influential critic Clement Greenberg wrote about this exhibition: "the surprise and achievements of Pollock in a not-so-abstract abstractions". 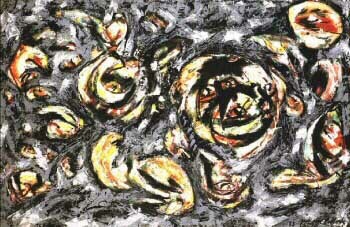 Then Pollock has surpassed the influences and has its own language. Guardians of the secret, 1943, shows the ambivalence of figuration and abstraction at a time: two vertical figures flank a central panel filling of symbols in style all over; "In the part low Pollock paints a dog, maybe, serving, along with vertical figures, as guardian of the psyche of the painter, depicted in the central panel" (Frank). Mural (1943) begins to experience the dumping of paint and the all-over, a technique invented by him, which this piece is his first great work; It was commissioned by Peggy Guggenheim to his private apartment painted in a single session. Man, Bull, bird (1938-1941). Anschutz collection. In 1945 he/she left Manhattan and moved to a farm in Long Island along with Lee Krasner; There, in a study that it is constructed, originate the first pictures drip with large dimensions (undulating Senderos, 1947), completely abstract. In 1946 and 1947 he/she puts into practice a new way of painting known as leakage or dripping, which consisted of dropping directly the boat or the brush, drops of paint on the canvas in the soil and the artist painting from all directions; This new conception of the surface of the fabric is also largely his own and is called all over (number 4, 1949). "When I am inside the box, I am not aware of what I'm doing. It is only after a review when I realize what they've been stuck. I am not afraid of making changes, because the pictures have a life of its own. I try to let it flow. Only when I lose contact with the work, this is a disaster. If not, all is harmony, a simple give-and-take, and the picture goes well"(Pollock). The technique of the spill was a great deliverance for Pollock; definitely began to get out of his unconscious a huge creative force and variety of feelings; No picture is repeated, they are all different. "Pollock limited space of each picture, aware always frame as point of separation of the picture of the real world. "The path defined by the shed painting, Pollock developed a style in which the different elements of the painting (especially the line and color) could operate, for the first time in Western painting as a completely independent pictorial elements" (Frank). The most important works of this period include Sea Change in 1947, Number 8 of 1949, Number 1A of 1948, Cathedral of 1947 and Lavander Mist of 1950. The cup of tea (oil on canvas, 1946). Collection of Burda Freida (Baden-Baden, Germany). Towards 1949 returns a certain figurative, as in 1949 spider's departed and the black drip paintings of 1951 and 1952. 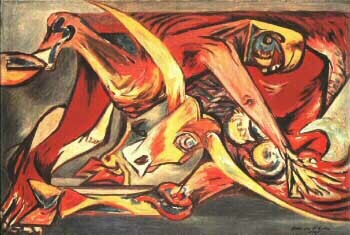 In June 1952 he/she writes to his friend Alfonso Ossorio: "I have had a period of drawings in black and white on canvas, with some of my first images resurfacing; I think that the abstractionist are going to find annoying"; his prediction is fulfilled completely when he/she shows his neofigurativos works at the Betty Parsons Gallery (with who would expose between 1948 and 1951) in that same year; critics rejected them. This time not led Pollock to new developments and in the middle of the six returns to the compositions all over; some friends see it as a repetition and a problem for the artist who has evolved and grown without breaks for more than ten years. However, performs works capital as Number 28, 1951 and Blue Poles: Number 11 of 1952, in which incorporates the masts in a huge abstract painting. 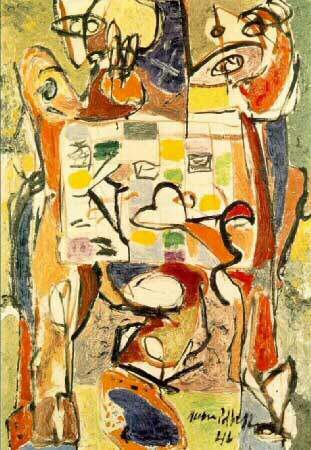 In the last pictures are also figurative concrete elements, as in Ocean Greyness (1953), where it appears the eye, which had been a motif used by Pollock in his early works; in Eastern and Totem (1953), it pays homage to Matisse and Gorky introduced biomorphic forms in vertical planes. Ocean Greyness (oil on canvas, 1953). Solomon R. Guggenheim (New York, United States) Museum. In the last months of his life, Pollock fight against a feeling of failure and depression, and alcoholism. He/She died on the spot, at the age of forty-four years, the night of August 11, 1956, in Springs, when their car crashes against a group of trees. After his death, Pollock and his work became a legend fueled his torturous life (which would make it also one of the forerunners of the beat generation) and became the most famous painter of America, as well as the most acclaimed representative of abstract expressionism. The first exhibition retrospective of his work was held at the Museum of modern art in New York in 1956. In November 2006, his work entitled number 5 (1948) became the box more expensive history so far, since the Mexican investor David Martínez paid by 109,6 million euros. SANDLER, Iring, American Art in the 20th Century, London, Prestel, 1993. FRANK, Elizabeth, Pollock, New York, Abbeville Press, 1945.